"Hair trends, like fashion trends, change year to year and season to season. To find out what's hot for 2009, check out our list of the latest bridal hair trends"..
Congratulations, you are engaged! Now a million questions are running through your head. Where will we have the wedding? What about my dress? How will I wear my hair? Though your wedding is just one day, it will be captured forever in photographs. So on your wedding day, you want to look picture perfect, and a big part of that comes down to your hairstyle. Hair trends, like fashion trends, change year to year and season to season. To find out what's hot for 2009, check out our list of the latest bridal hair trends. In recent years, brides have been going away from wearing a veil and that trend continues into 2009. Instead, wear your hair pulled off your face and secure it with a tiara or headband. The emphasis is on romance in 2009, including loose updos, ringlet curls and long, soft waves. Up or down? That's the age old dilemma when choosing a wedding hairstyle. One of the most popular trends in terms of bridal hairstyles is the half-up, half-down look. This style pulls your hair away from your face, so that everyone can see how beautiful you look. However it also leaves the back portion of the hair long and flowing. It's a more natural look than a coifed updo. Check out this video from hairstylist James Warner of Joe Carol. He creates a very soft, curly look in an half up, half down style that is absolutely gorgeous. This hairstyle is perfect with an off-the-shoulder gown. If you wear your hair all the way up with an off-the-shoulder or strapless dress, it can make your neck look too long and lanky. Retro-inspired looks are very popular wedding hairstyles. If you aren't spending money on a hairstylist for your wedding, you can still get a fancy 'do. The 1960s pin-up style look is easy to do yourself or with the help of your bridesmaids. You shouldn't wash your hair the day of your wedding. It will be too soft to hold the style. Instead wash it the day before. Begin by forming a simple French twist in the back of your hair and secure it with several bobby pins. Then take small sections on the top of your hair, approximately 1-inch wide, and begin rolling them into loops. Secure each loop individually with bobby pins. Continue forming the loops until you have finished with all the hair on your crown. Brush your bangs to the side and spritz the entire head with hairspray. Add a lace or beaded headband to finish off the look. 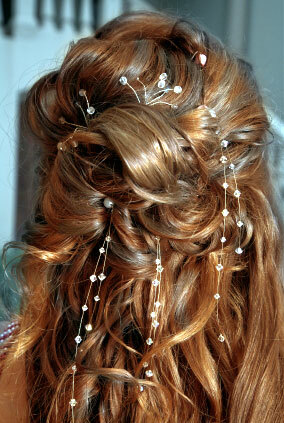 Crystals will be popular bridal hair accessories in 2009, but not just in the form of hair combs, pins and headpieces. Crystals also will be woven into the hair on thread to give your style an overall sparkle. They can be used with long or short hair, whether worn up or down. If you are using a stylist for your wedding, schedule an appointment one to two months ahead of your wedding date. Bring in several photos for ideas on how you'd like to wear your hair. Also bring any hair accessories with you to the appointment. Have your stylist try out a variety of styles until you find the one that you love. Make a hair appointment to get a trim about 3-4 weeks before your wedding day. Also set another appointment approximately a week before the wedding to make your final decision about your bridal hairstyle. If your hair is short and you'd love to wear it long, don't overlook the possibility of hair extensions. Your stylist can use natural extensions that match perfectly with your hair color. The day of your wedding, schedule your stylist to arrive several hours before the wedding. If you can't step into your wedding gown, be sure to put on the gown before the hairstylist begins working on your hair. Be sure to secure your hair with plenty of pins and hairspray. 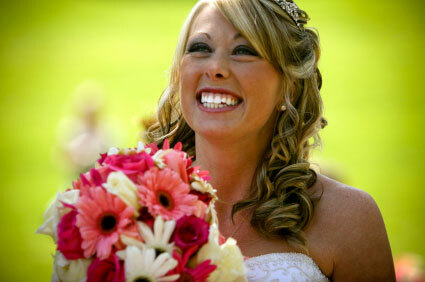 Your wedding day can last up to 12 hours or longer, and the photographer will be snapping pictures the entire time. You don't want your hair to fall by the time of your reception. Browse bridal hairstylists near you. Their websites almost always include a lot of photographs and examples.